An under-performing – and ultimately unprofitable – international network has been part of Qantas’ fabric in modern history. The old thinking was that the international network ensured loyalty (and corporate attractiveness) in the domestic market, which was not just handsomely profitable but enough to subsidise international: in FY2012 it recorded a domestic profit over AUD600 million while international recorded an AUD450 million loss. A series of factors, likely irreversible, changed the willingness to support a largely loss-making network and Qantas has conducted two restructures of its Asian and European network in as many years. 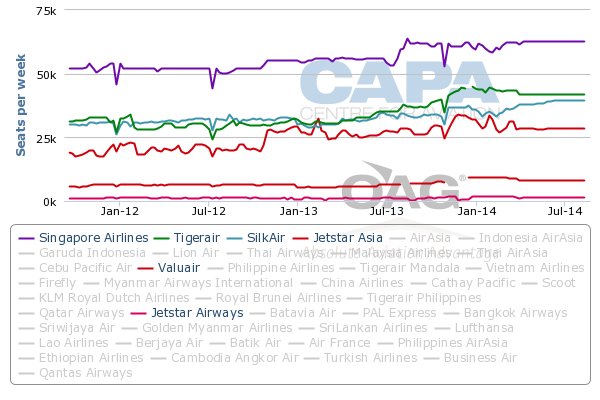 But Qantas’ Asian network is still under-performing. 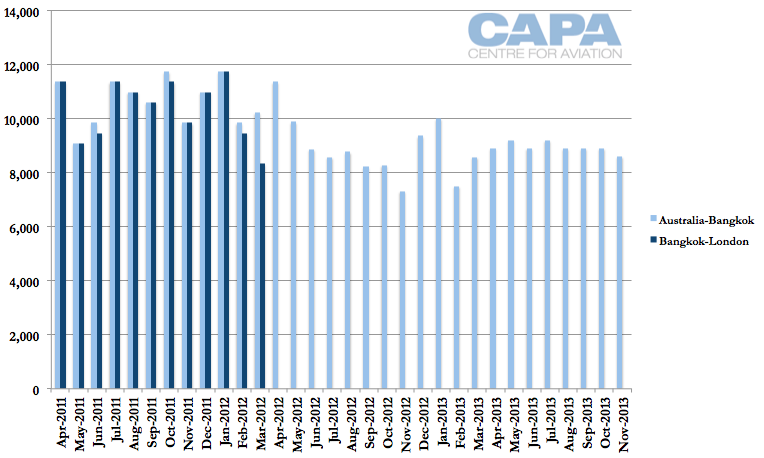 Load factors to Singapore have dropped nearly 10ppt since Qantas discontinued Singapore-Europe services. 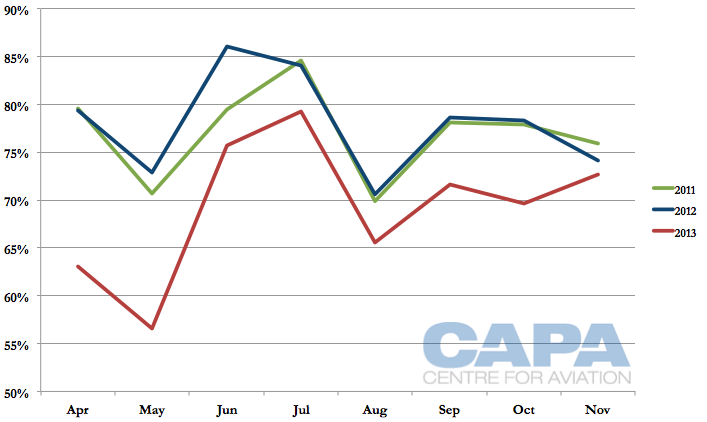 Although the change is less than a year old, Qantas faces structural challenges owing to limited feed and competition. Its partnership with Emirates may be diluting revenue, while a sinking Australian dollar has variable impacts. Meanwhile Bangkok and Hong Kong, de-hubbed in 2012, also show challenges. Qantas has spoken of better integrating Asia-based Jetstar units with Qantas to act as feed but this, unsurprisingly, has yet to occur. The challenges in Asia are far out-paced by serious, and potentially de-stabilising, factors at home. Qantas has too many crises to address, and its Asian network has not been granted sufficient airspace yet. But time is running out. Singapore and Hong Kong are Qantas’ largest destinations by far in Asia, with three or fourth times the capacity of the next largest destination, Tokyo. These two destinations, and to a lesser extent Bangkok, have experienced the greatest changes following Qantas’ Asian restructure, as the carrier reduced and then ended the use of Asia as a stopover point for its valuable European flights. These Asian destinations have been impacted by the routing changes, generally by seeing weak performance, and will be examined in this report. But first we look at Qantas’ other Asian destinations, which have not been impacted by the restructure, to see that they are generally performing as they have in the past or better. On a positive note this indicates that weakness in Singapore, Hong Kong and to a lesser extent Bangkok is unique and not symptomatic of Qantas’ presence in Asia. 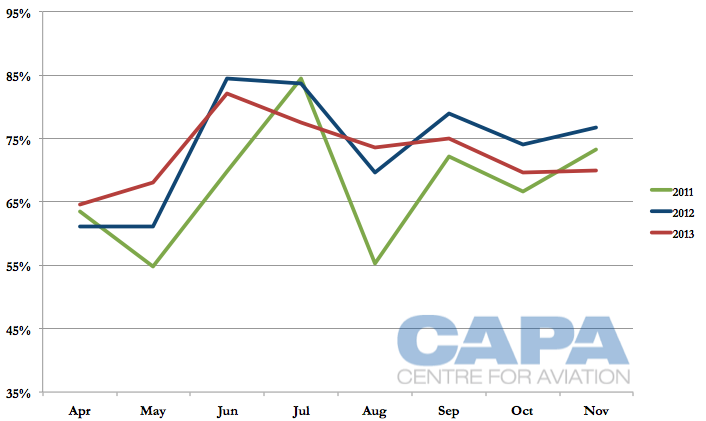 Qantas’ performance in mainland China in 2013 has dipped from 2012 but is well ahead of how it was doing in 2011, based on load factors supplied to BITRE from April through November. Yield information is not supplied. 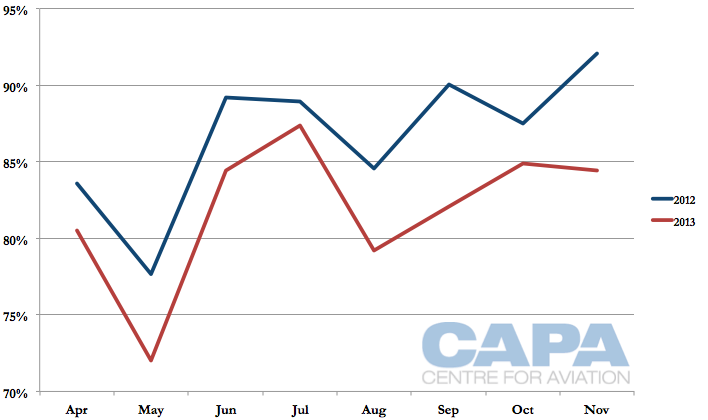 Apr-2013 was the first month of Qantas’ re-structured Asian network, and Nov-2013 is the latest month for which data is available. Qantas’ only online presence in mainland China is Shanghai Pudong with typically a daily A330-300 service from Sydney. 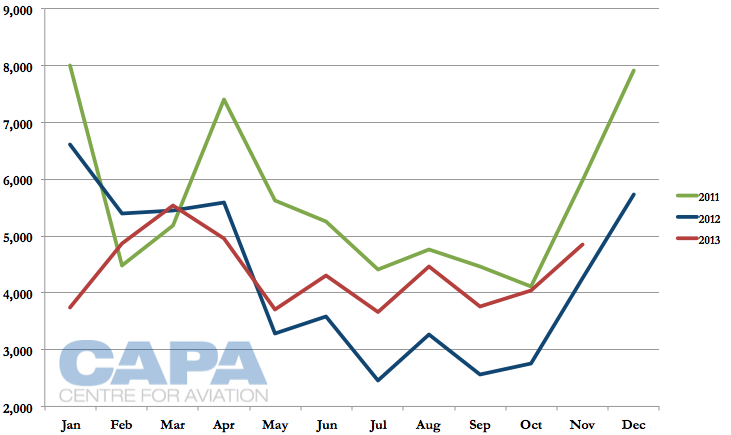 The average load factor from Apr-2013 to Nov-2013 was 75%, down from 77% in the corresponding period in 2012, but still above 2011’s performance of 70%. 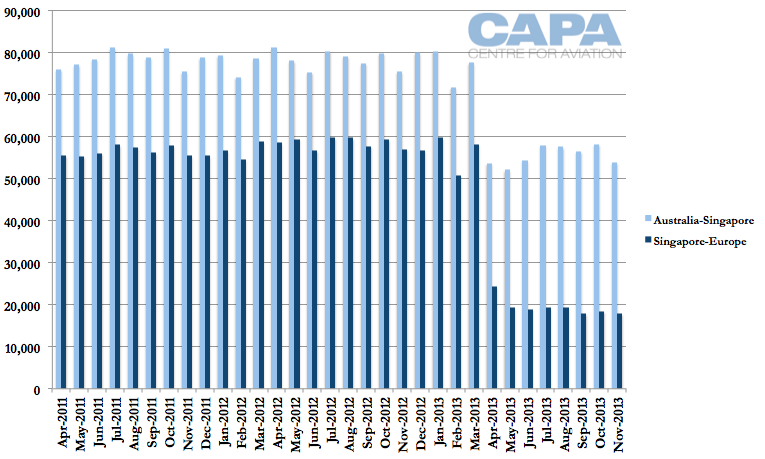 Load factors have grown with the approximately 6% increase in capacity between 2011 and 2013. Also in North Asia, Qantas has shown strong performance in Japan. Qantas’ sole Japanese service is a daily flight between Sydney and Tokyo Narita. Prior to Apr-2011 Qantas served Tokyo from Perth, and previously from Melbourne too. Jetstar serves Osaka and Tokyo. 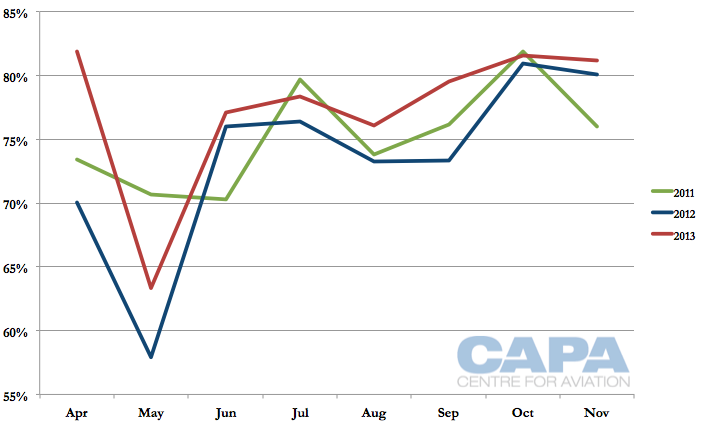 Qantas’ performance is distorted by the Mar-2011 Great East Japan earthquake that sharply dented travel. 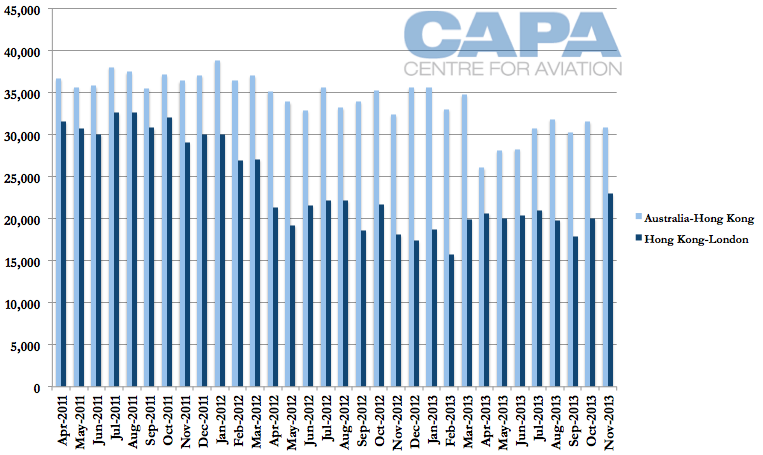 But even looking beyond that, Qantas’ position in 2013 was stronger than 2012, with peak load factors exceeding 85%. 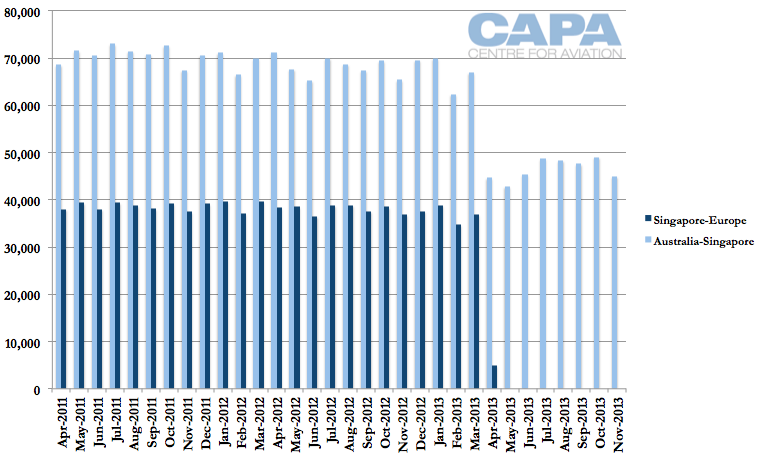 Between Apr and Nov 2012 and 2013, Qantas’ average load factor grew about 3ppt. Capacity has grown by about 7%. In Southeast Asia, Qantas’ sole Indonesian destination is a four times weekly service to Jakarta. 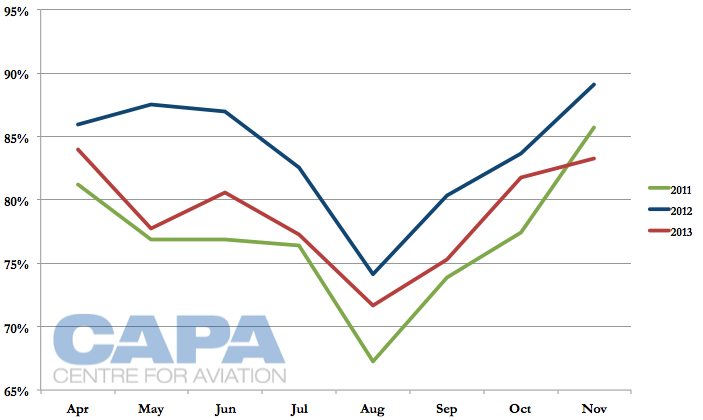 Performance has overall been weak with 2012 and 2013 load factors in the low 70% range. 2013 saw about a 1ppt decline from 2012. 2011’s performance was 67%. The impact in this market is likely from Garuda Indonesia, which is growing its position in Australia, and not just from the traditional leisure destination of Denpasar (Bali). Garuda can offer non-stop service to Jakarta from cities other than Sydney, Qantas’ sole outbound port for Jakarta. The situation will likely get worse before better as Garuda continues to grow, including deploying new 777-300ERs to Australia. (And it surely cannot be too long before Lion turns its attention to its southern neighbour). Garuda’s situation is evident from the fact that since 2012 it has carried about the same number of passengers as Jetstar but with a much higher amount of capacity. Qantas’ sole service to the Philippines is a four weekly flight from Sydney. As with Shanghai, 2013’s performance is down from 2012 (by 5ppt) but is still above 2011’s performance. 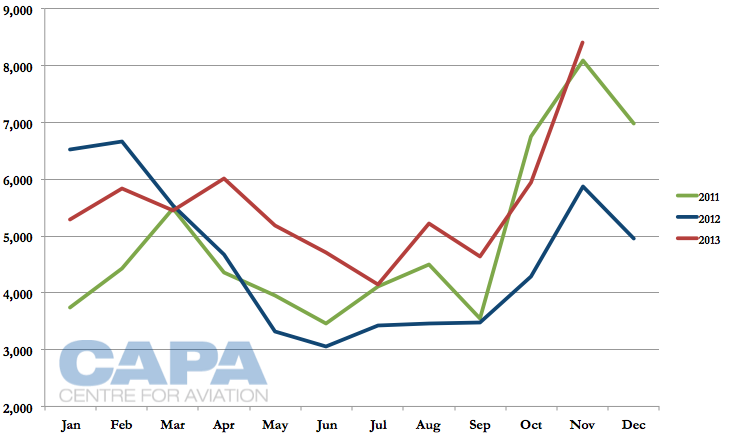 Unlike Indonesia, however, 2013’s load factor was still highly acceptable, at 79%. 2012’s 84% performance was strong. Qantas in Mar-2013 ended Singapore-London flights and in Apr-2013 ended Singapore-Frankfurt services as part of its hub switch from Singapore to Dubai. The Melbourne-Singapore-London and Sydney-Singapore-London services were operated with A380s. To maintain links to Singapore, Qantas introduced A330 and 747-400 services to Singapore that terminated there rather than continue to Europe. This saw an overall decline in the number of seats Qantas flew between Australia and Singapore, but because previously most of the Australia-Singapore seats were occupied by passengers continuing to Europe, Qantas by default increased the number of seats it sold for passengers terminating in Singapore. Qantas says it actually increased Singapore-terminating seats by 40% as a result. So even though Qantas has reduced capacity to Singapore, it is selling more Australia-Singapore capacity. Qantas’ challenge has thus been to sell a far greater amount of Singapore capacity as an end point destination (or hub for limited onward Asian connectivity), where there is little transfer traffic on board. 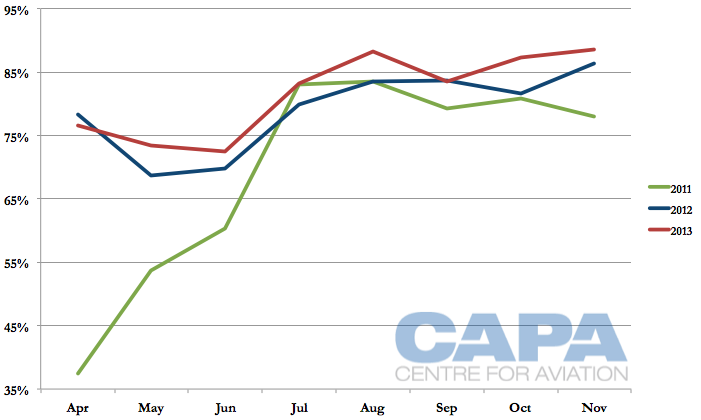 The above graph shows only Qantas capacity. Until the end of Mar-2013 Qantas operated between Australia and Europe in partnership with British Airways under a joint-service agreement. Including BA’s capacity the situation is much the same as including BA increases Australia-Singapore and Singapore-Europe traffic. Since moving the European stopover hub from Singapore to Dubai and commencing Singapore-terminating flights, Qantas has continued to offer about 90,000-100,000 seats a month between Australia and Singapore. Singapore Airlines has offered around 300,000 seats a month between Australia and Singapore, according to BITRE data. Qantas’ challenge is that it is selling one-third the level of SIA’s capacity with almost no connecting access beyond Singapore. 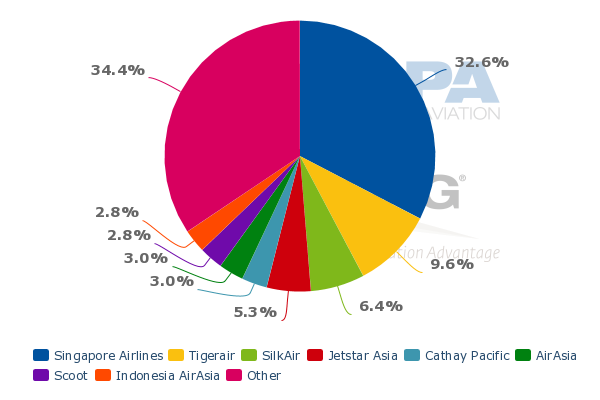 SIA in contrast has a commanding 39% share of seat capacity at Singapore Changi when including SIA and wholly-owned regional unit SilkAir. This gives SIA a breadth of destinations in Asia and beyond to sell to Australia whereas Qantas, with limited partnerships, is largely relying on the small local Singapore market. While Qantas may have an advantage with Australian corporate accounts, SIA has advantages in cost, product and frequency, serving more Australian cities with more frequencies than Qantas. Qantas’ performance between Australia and Singapore is reflective of its weak position: load factors are at some of the lowest levels in recent memory. SIA has not suffered as sharp an impact. Anecdotal fare evidence indicates yields are depressed too, significantly in some cases. Note: Scoot commenced Australian services in Jun-2012. While the Emirates-Qantas partnership has yet to reach its first anniversary, it appears that in some areas Emirates has gained the upper hand – and this is impacting Qantas’ Asian performance. A lesser publicised attribute of the partnership is Qantas and Emirates transferring passengers at mutual Asian destinations, with Qantas typically carrying the passenger from Australia to Asia and Emirates from Asia to Dubai (and beyond). This allows the two to find a low fare but also offer a traditional Asian stopover city. However it is apparent, according to some in the industry, that the revenue Qantas receives for an Asia-Australia segment is limited – and even below cost, further challenging Qantas’ Asian network. Also as part of the partnership, Qantas places its code on Emirates-operated flights between Australia and Southeast Asia (Bangkok, Kuala Lumpur and Singapore) that have local pick-up rights. Qantas-coded, Emirates-operated flights to those Asian destinations are often the cheapest fares in the market on full-service airlines. Emirates-coded and operated flights are also inexpensive. Qantas frequent flyers receive benefits flying on Emirates, so it is possible that Emirates is seeing more bookings between Australia and Southeast Asia from either Qantas codeshares or Qantas frequent flyers now considering Emirates a viable option due to loyalty – or timing, as Emirates operates some services at different times from Qantas. This would mean a clear benefit to Emirates with less obvious benefits to Qantas, especially on overlapping routes (to Singapore and Bangkok; Qantas does not serve Kuala Lumpur). 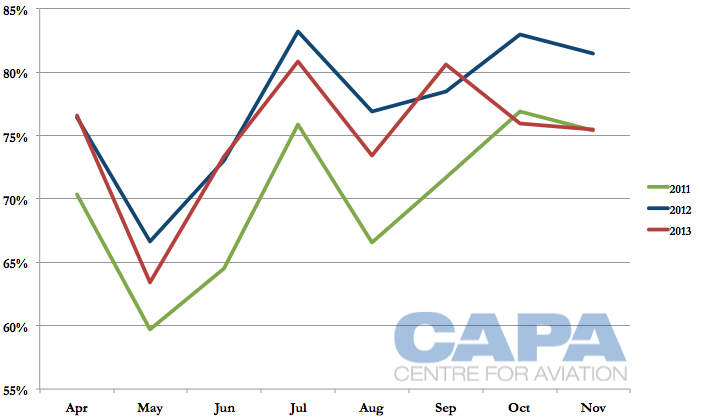 Looking at passengers Emirates carries between Australia and Singapore, as reported to BITRE, there was a sharp increase over previous years between Jun-2013 and Sep-2013. 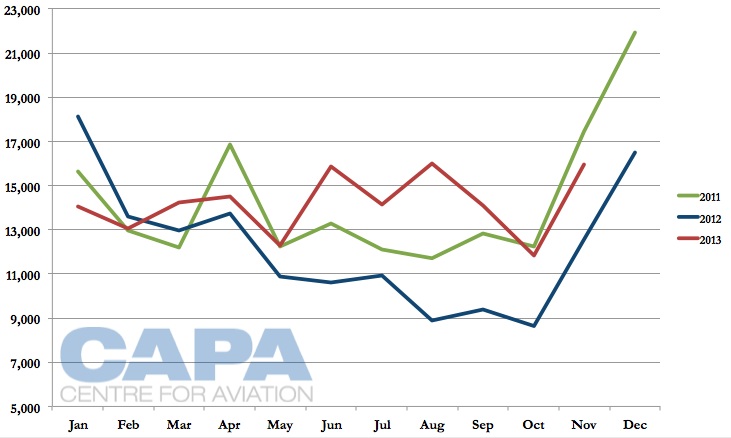 Overall, traffic in the first 11 months of 2013 was up 20%, but this was after a 12% decrease in 2012 compared to 2011. 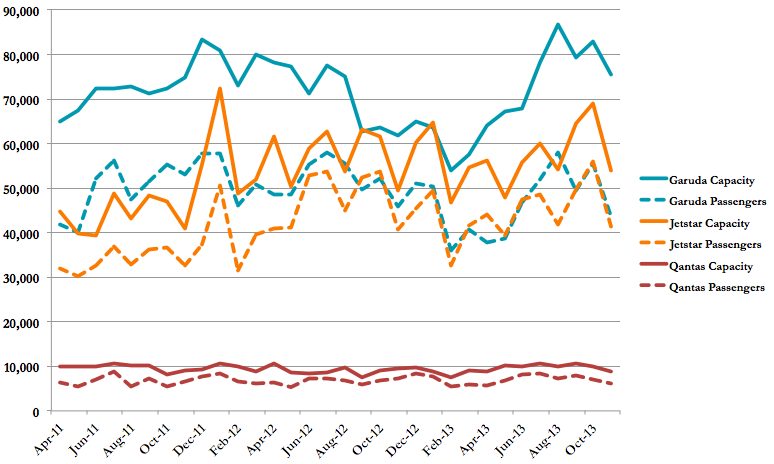 2013 traffic compared to 2011 is up only 4%. Singapore is Emirates’ largest Asian market from Australia, but it also serves Bangkok and Kuala Lumpur. Emirates carried 21% more passengers to Bangkok in the first 11 months of 2013, but to Kuala Lumpur Emirates was down 6%. This may be a reflection of capacity additions from AirAsia X and Malaysia Airlines into the Australia market, including Melbourne, the only Australian point Emirates serves from Kuala Lumpur. Bangkok has not seen such capacity growth. However, these measurements are imprecise. The Australia-Southeast Asia flights continue to Dubai, meaning Emirates can adjust the balance between Australia-Dubai (and beyond) passengers transiting through Asia, and taking local Australia-Asia and then Asia-Dubai traffic. The higher traffic volumes observed may be an indicator of other market developments. Emirates’ Australia-Asia services are not always ideally timed as they can depart or arrive at off-peak hours. For example, Singapore-Melbourne and Bangkok-Sydney arrive in Australia in the morning, but Singapore-Brisbane and Kuala Lumpur-Melbourne arrive late at night and then depart during midnight hours. This facilitates the flight’s sectors to/from Dubai and ultimately Emirates’ connections from its Dubai hub. But there is theoretical scope for closer integration should Emirates believe it viable. The Australia-Asia market is important for Qantas but is a small part of Emirates’ network and Emirates would hesitate to disrupt its Dubai connection flows for marginal gains between Asia and Australia. In the Qantas-Emirates partnership, Qantas needs Emirates more than Emirates needs Qantas, so Emirates would likely not feel pressured to make a move for the sake of helping Qantas. Any closer cooperation could be challenging for Qantas, which is already under pressure to exit too many markets – even if they are unprofitable. Integration with Jetstar Asia, neither easy nor insurmountable, could help Qantas in Singapore – and Hong Kong? Qantas has the opportunity to boost its Singapore performance by working more closely with Singapore-based Jetstar Asia, which serves about 20 destinations in Asia, mainly in Southeast Asia. Qantas already has limited codeshares on Jetstar Asia's network. Qantas has spoken of working more closely with Jetstar units in Asia, but this has yet to materialise. Qantas would look to better accommodate Qantas full-service passengers, especially business class, on low-cost Jetstar. Jetstar already has experience with this by interlining and transferring baggage. On long-haul flights passengers are even provided food and beverages and for overnight flights an amenity kit. The challenge is more exploring the options (against the background of serious and bigger challenges at Qantas) and implementing them than it is anything structural. Jetstar Asia could provide a boost, but nowhere near the scale of SIA and SilkAir. Jetstar Asia's network is limited, with some flights not operating daily while others might depart prior to Qantas' long-haul arrivals, limiting connectivity or creating very long transfers. 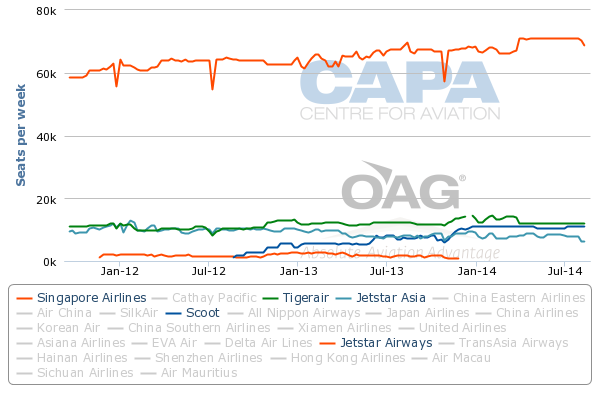 Jetstar Asia has also lagged Tigerair's growth in Southeast Asia while cutting capacity from North Asia. Jetstar Groups' Feb-2014 partnership with Emirates, covering codeshares and frequent flyer arrangements, shows the potential - but also the limitations - as Emirates does not face Qantas' management-consuming challenges. 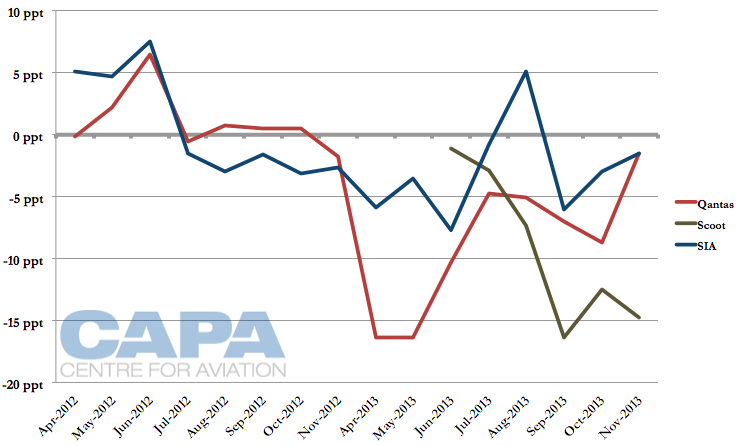 Qantas' Bangkok performance has dropped since 2012, although load factors are still typically above 80%. Qantas had offered a Sydney-Bangkok-London service until Mar-2012 when the Bangkok-London leg was cut in favour of connecting flights on BA's Bangkok-London service (BA cut Bangkok-Sydney). 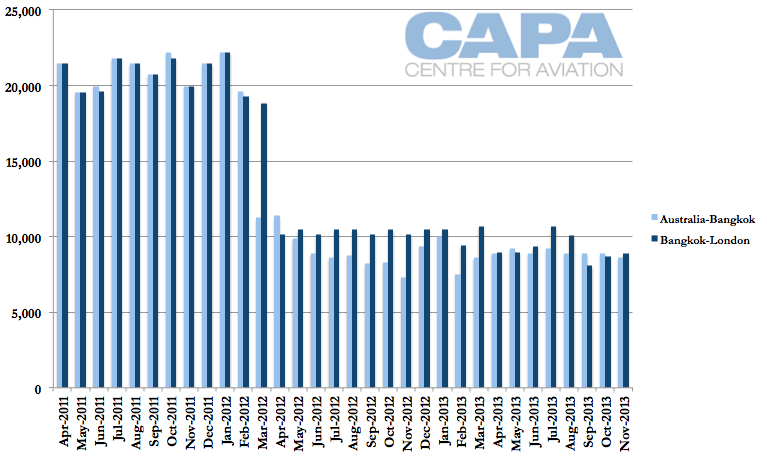 Mar-2013 saw the end of the BA-Qantas JSA, making Qantas rely more on the local Bangkok market. Qantas in Bangkok has had an additional year of building Bangkok-terminating traffic. While Qantas was more exposed to onward European traffic from Bangkok as a percentage of capacity, the actual amount of capacity was far lower than in Singapore. Qantas had offered a daily Melbourne-Hong Kong-London flight until late Mar-2012 when the Hong Kong-London service was withdrawn. Hong Kong has seen strong gains in load factors, but still outpaced by Cathay Pacific's performance of load factors in the low 80%. Feed again is an issue. Even though Hong Kong is home to Cathay Pacific, also in oneworld, Qantas and Cathay have very limited commercial arrangements. The planned launch of Jetstar Hong Kong could provide some new network opportunities, but as in Singapore there would be some practical and strategic limitations. Qantas and Jetstar Hong Kong could also face regulatory restrictions, such as third country codeshares, which are more restricted in Hong Kong than Singapore. As with Bangkok, Qantas in Hong Kong had adjusted for longer in selling Hong Kong as an end destination. Hong Kong's access to the Pearl River Delta gives it a larger catchment area than Singapore. Qantas in Hong Kong had proportionally the lowest onwards European capacity, but under the JSA, with BA's multiple flights, exposure was high. Qantas is in some ways stuck between a rock and a hard place. The protracted longhaul dilemma, now largely resolved by the Emirates partnership, had distracted management attention to the extent that the Asian market future could not have been given the attention needed. As a result the the current situation has become unsustainable. Load factors to Singapore make that clear, but Bangkok and Hong Kong also have yield challenges, as do some other points. Qantas in recent times has embarked on new or expanded Asian partnerships with China Eastern and China Southern, but these do not cover a large portion of Qantas’ Asian network today. 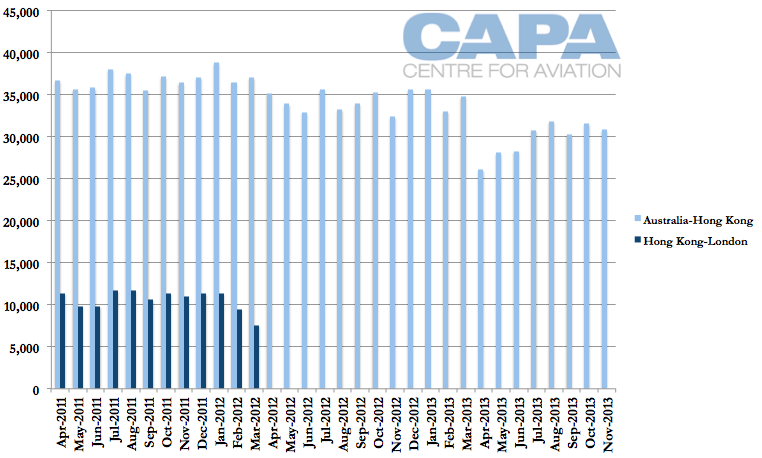 There may be a theoretical case for cutting capacity, but the longer term fall-out may not be acceptable. It is scarcely conceivable that a major Australian airline would forsake the potential for expansion in the world's highest potential market, especially when Australia is increasingly looking towards - and even integrating with - Asia. This is where the market growth will be - and not incidentally where a great deal of corporate activity will occur; maintaining a strong corporate profile is something that requires global coverage, especially in those markets where business travellers want to travel. And meanwhile, emerging competitor Virgin Australia is steadily compiling a virtual network that is increasingly attractive to Asian flyers; it has some way to go in its relationship with part owner Singapore Airlines, but the foundation of an Asian strategy is clearly in place. For Qantas, a strategic decision is needed, but no obvious solutions present: the remaining potential full service partners are limited. Full network integration with Jetstar has yet to occur, a feature that, while challenging, is not insurmountable. But even then additional opportunities are currently limited, given Jetstar Asia’s network. Some changes to Emirates’ network could see it effectively replace or at least supplement Qantas, but this too has variable consequences. Emirates is already the de facto national carrier of India (a mantle which Etihad too is now contesting); adding Australia to the claim will be a big step. Emirates is keen to expand the Qantas relationship, but Qantas will not want to resort too quickly to that option without first exploring others. The only certainty is that if Qantas still intends to have a profitable international network, there will be need to be changes in the way it addresses its Asian markets. Among other things, this will involve redefining what it means to be a high-cost end-of-line carrier. That is a challenge it has addressed before and must now confront in a different way if it is to achieve the potential that Asia offers.